After a victory in Washington State with I594, gun control groups are now setting their sights on Oregon with for a similar bill. Now the same groups have their sights, poorly written laws and Bloomberg billions set on Oregon. A similar bill was defeated in the last two legislative sessions in Oregon, but now democrats have expanded their majority in the Senate by two seats and plan to try again in 2015 and are expecting to win. God speed to those in the beaver state. GRANTS PASS — Fresh off a victory in Washington state, a leading gun control group backed by billionaire Michael Bloomberg is hoping to make Oregon its next prize in a campaign to require gun sales to go through universal background checks. Everytown for Gun Safety backed a voter-approved initiative in Washington last year that made the state the 17th in the country to expand background checks past the federal standard applying only to licensed gun dealers. “This is our top priority,” said the group’s spokeswoman Erika Soto Lamb. The organization came out of a merger last year between Bloomberg’s Mayors Against Illegal Guns, and Moms Demand Action for Gun Sense in America. It has been spending tens of millions of dollars on political operations. Now its attention is on Oregon, where the state Legislature narrowly failed to pass legislation two years running to require background checks for private gun sales. According to state records, Everytown spent nearly $600,000 on the 2014 election — $450,000 in contributions to candidates and committees, and $110,000 on other grassroots efforts. Part of that was devoted to strengthening the Democratic majority in the state Senate, the key battleground. Democrats ended up expanding their majority by two seats to 18-12 in the Senate. The party holds a stronger majority in the House. Gov. John Kitzhaber, a Democrat, is a longtime supporter and is expected to sign the bill if it passes. “There’s a loophole there that can be closed,” said Lamb. 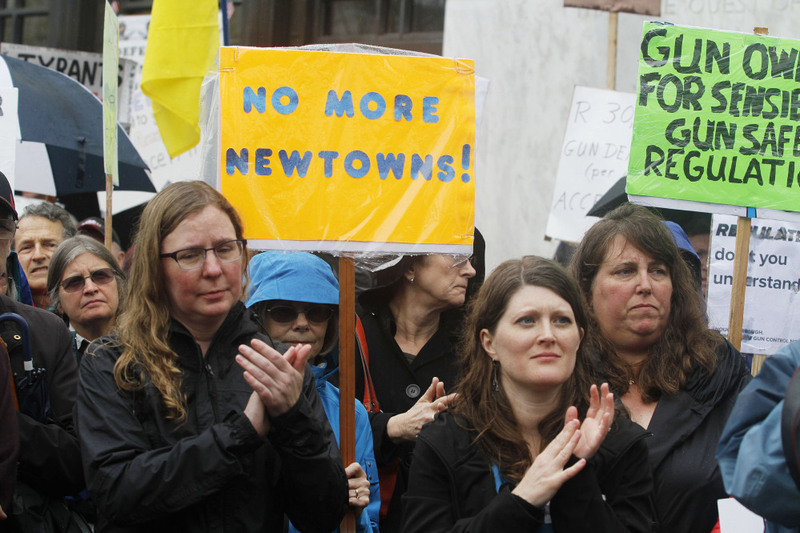 Oregon voters extended background checks to require them for sales at gun shows in 2000. Senate Judiciary Chairman Sen. Floyd Prozanski, D-Eugene, plans to introduce legislation to expand that to private gun sales. The bill would require anyone selling a gun privately to call state police for a background check on criminal history and mental illness. It would exclude sales among family members, inheritances and antique guns. Opponents include Democratic state Sen. Betsy Johnson of Scappoose and the National Rifle Association. Under federal law, background checks through the National Instant Criminal Background Check System are required for sales by licensed gun dealers, but not at gun shows or private transactions. The checks target convicted felons, people under indictment, the mentally ill, drug users, people under restraining orders, dishonorably discharged veterans and people in the country illegally. But not all states report mental health records to the system. About 40 percent of Oregon households have guns. And the state has had its share of horrifying shootings. In 1998, Kip Kinkel went to his high school in Springfield with guns his parents bought to teach him to shoot. He opened fire on the cafeteria, killing two and wounding 25. In 2012, three days before the deadly Newtown, Connecticut, school shooting, Jacob Tyler Roberts took a stolen semi-automatic AR-15 rifle to the Clackamas Town Center mall outside Portland, where he killed two people and wounded one before killing himself. Last June, high school freshman Jared Michael Padgett took his brother’s assault-style rifle to school. He killed a student and wounded a teacher before killing himself. None of those shootings would have been stopped by background checks, said Johnson, the key opponent of last year’s bill. State police currently conduct about 19,000 background checks a month and deny about 190 of them, Prozanski said. While private transactions don’t require a check, sellers have an incentive to do them. If a gun they sell is used in a crime, they can be liable if no check was done. They are protected if a check was done. Prozanski said he hopes that, with the increased number of Democrats favoring gun control in the Senate, he can overcome Johnson’s opposition. The gun control group contributed $75,000 last year to Democratic Sen. Chuck Riley of Hillsboro, who defeated a Republican incumbent opposed to expanded background checks, and $250,000 to the governor. State records show the NRA made no contributions in the race, though it gave $21,700 to candidates overall.